OSLO, Norway (AP) – Government-controlled oil company StatoilHydro ASA said Friday that a 25,000-barrel North Sea oil spill was caused by a broken hose used to load crude onto tankers. The spill, which happened Wednesday, was the second worst in Norway’s offshore history. The oil, spilled at the Statfjord offshore field, was not expected to reach the Norwegian coast, about 200 kilometers (125 miles) away, and much of the light crude was expected to evaporate or break up in waves, the company and experts said. The crude spilled when it was being transferred to an oil tanker from a floating loading buoy. StatoilHydro said it had used a remotely operated miniature submarine to inspect the system and that it found a 19-inch (48-centimeter) diameter flexible oil hose that had been torn in two. The cause of the break was not immediately determined. The company said no more oil was leaking and the Statfjord field was producing normally. StatoilHydro said it would try to used spill collection systems to remove the remaining oil from the surface of the ocean. The spill was smaller than the worst oil leak in the history of the Norwegian oil industry, in 1977, when an oil platform blowout spewed 78,000 barrels of crude into the ocean. StatoilHydro employs about 31,000 people and is the main player on the offshore fields that make Norway a major exporter of oil and natural gas. 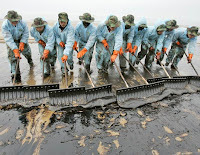 SEOUL 10 December – Nearly 10,000 people are involved in clean-up as the Hebei Spirit oil slick spreads 40km along the shore, polluting 8,200 hectares of coastline. Five aircraft and 138 specialist ships have been deployed. The breaches in the vessel’s hull have now been breached while the remaining oil is transferred into the tanker Seyang, before Hebei Spirit is towed into Daesan port. Taean Coast Guard is investigating 20 people, including the tugmasters, while the tanker’s manager, V.Ships Singapore, today praised the master “The quick action of Capt Chawla helped lessen the oil spilled,” said V.Ships. “The Hebei Spirit anchored in a designated area, kept a proper anchor watch and displayed proper anchor signals. When they realised that the tugs were going to pass close by in a potentially dangerous situation, they attempted VHF communication – however without response. Subsequently, the Marine Police was contacted and they also attempted to contact the tug, again without response.” “Samsung needs to step up and take responsibility,” a spokesman for the owners told Fairplay today. Shares in Samsung Corp, Samsung HI (charterer of the crane and tug) and insurer Samsung Fire & Marine dropped by 3-8% today. 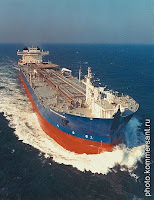 The tanker master was praised for trying to move his ship by slackening the anchor chain and using the main engine, and for quick use of ballast after the collision to reduce the outflow of oil. Wilkipedia keeps a list of oil spill accidents, check it out here.